We want FZF to be accessible and comfortable for all, so here’s some information on what the actual zinefest will be like. We’re open to suggestions, so please feel free to get in touch! The 2019 zinefest will take place on the 4th floor of Barnard College’s Barnard Hall, which you can find at 3009 Broadway, New York NY 10027. When you arrive at Barnard, there will be signs pointing the way! The building where the zine fest is held, Barnard Hall, is wheelchair accessible by a ramp located on the left side of the building, to the left of the main entrance. There are two elevators in the building, one on the left and one on the right, both near staircases. However, the closest subway station (116th Street on the 1 line), is NOT wheelchair accessible. This is a list of MTA stations re: wheelchair access. Vision-related: The James Room, the largest room of the zine fest, has both artificial and natural lighting. There are huge windows in the room which help bring in outside light: on a sunny day, the room will be brightly lit. Other rooms include 405-407 and 409; you can view photos here. Sound Levels: There will be music playing in the large room. If you have any sound issues, or just feel it’s “too loud,” we’re cool with turning it down! If you’re seeking a quieter zine fest experience, we recommend coming at the beginning of the ‘fest, when there will be less folks and potentially less background noise. We will also have a “Quiet Room” available for folks who want to step away from the main space and hang out. Crowd-related: If you’re sensitive to crowds, we suggest coming by at an earlier point in the zine fest when there will be fewer people. Temperature: The main tabling room can get very warm (! ), we recommend tabling zinesters bring layers. 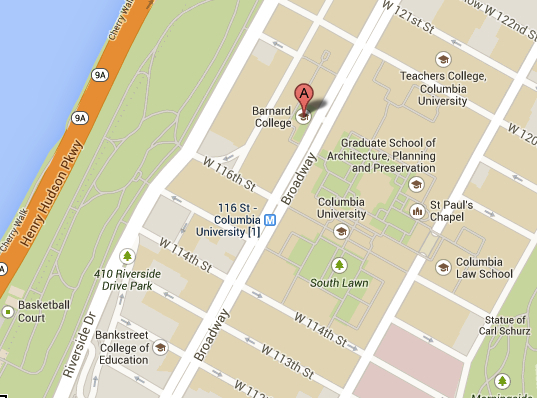 Security-related: Barnard College is a college campus, and is staffed by campus security. Most noticeably, there are security guards at entrances to the campus. You do not need to “show ID” or interact with the guard to enter campus. Contact: If you have any questions on day-of, please get in touch with any of the Volunteers or Organizers so we can help out. If you want to photograph an individual, or two people together, or a small cluster of people, ask for those people’s consent before you photograph them. Ask in a simple way: “Would it be ok if I take your picture?”. Give them the opportunity to say no. If you are not able to obtain consent from a group of people, do not photograph them. Individuals who proceed without consent, and to the disruption of participants, may be asked to cease photographing. If you are in the room and don’t want to appear in the background of a photo, feel free to let the photographer know. Please also let an organizer know if you have any problem with invasive photography, and we will intervene.